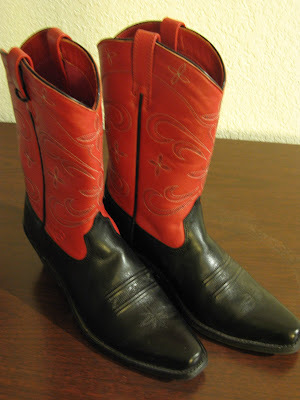 The Un-Official Blog of Romance Author Maddie James: Ahhhhhh... Boots. This picture just about says it all. Can you hear that big sigh behind the camera. Well, it was there. I love boots. Correction, I love cowboy boots! I would wear them all summer if I could get away with it. I have a pair I bought a couple of years ago and they are my utlimate, go-to winter shoe, particularly with jeans. See? 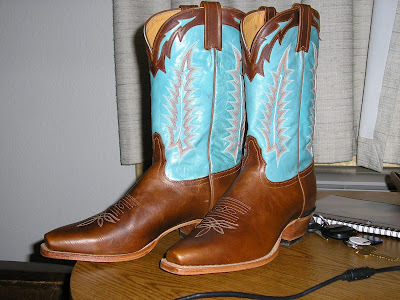 Here are my boots when they were brand spanking new. Can't you tell? I bought them while on a work trip. They are definitely sitting on a hotel table. In fact, I bought them in Valentine, Nebraska at Young's Western Warehouse. I visit there about once a year when I work at one of the nearby schools. These are the boots of my heart. I love the style, the snub-point of the toe, and the heel. Love them. After two years, they fit my feet like gloves and I can slip them off and on my feet in no time while running through airport security checkpoint. Seriously, I can do it. And I do it often. And do you think my boots get noticed. Um. Yes. They do. And do I like it. Well.... (smile) it IS kind of fun when people talk about them. So, you see, I love these boots so much that today, I had no intention of buying another pair. None whatsoever. But I just happen to be working in Valentine again this week and across the street from the favorite restaurant is...you guessed it...Young's Western Warehouse. I swear, I had no intention of buying boots. Nada. None. There they were. Front and center on the sale table, first thing I saw as I entered Youngs. Right there. Waiting. The favorite toe. The right heel. And my size. The only pair left. And black. I'd wanted a black pair. And red. How can one pass up red? And...won't these look great with my black jeans? Oh, and the price? Hm, let's just say I saved $100.00. A deal? You betcha. Those babies were just sitting there waiting on me. After all, I only get to Valentine once a year. 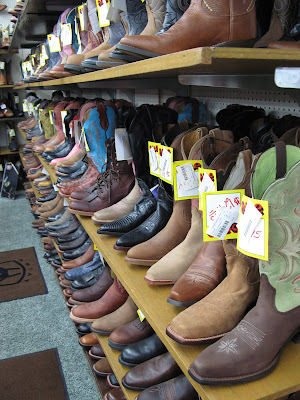 Ohhh, I just love those Ariat western boots. I own one pair in basic black, my sister has the all red pair. I'd looove to get a colorful pair similar to yours some day. They are so comfortable. Yes! They are comfortable! I'm looking forward to wearing them home on Friday with my jeans. I'll get to test-run then through airport security in Rapid City. Hm, I bet they see a few pair of cowboy boots run through there, huh? Boots?...yep...I wear 'em...a lot. Even in summer. My dream pair is sky blue ostrich, oh baby, oh baby! Great boots. Enjoy them, you deserve it. Thanks! I will enjoy them. My son had a pair of ostrich boots once...his girlfriend bought them for him. He left them in his car and guess what? Someone broke in and stole them. He heard about THAT for a while. :) Still, they are getting married next month so I guess she got over it. Thanks for dropping by, Michael and Laura.